Cytokeratin 6 antibody LS-C392262 is an unconjugated mouse monoclonal antibody to Cytokeratin 6 (KRT6 / CK6) from human, horse and sheep. Validated for Flow, IF and IHC. Synthetic peptide from human keratin 6 (GSSTIKYTTTS, aa545-555 of UniProt P48668). Percent identity by BLAST analysis: Human, Sheep, Horse (100%); Mouse, Rat, Ferret, Cat, Bat, Hamster, Elephant, Dog (91%); Bovine, Pig, Opossum (82%). 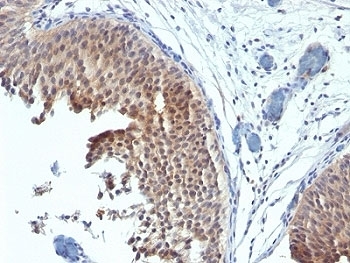 In humans, multiple isoforms of Cytokeratin 6 (6A-6F), encoded by several highly homologous genes, have distinct tissue expression patterns, and Cytokeratin 6A is the dominant form in epithelial tissue. The gene encoding human Cytokeratin 6A maps to chromosome 12q13, and mutations in this gene are linked to several inheritable hair and skin pathologies. Keratins 6 and 16 are expressed in keratinocytes, which are undergoing rapid turnover in the suprabasal region (also known as hyper-proliferation-related keratins). Keratin 6 is found in hair follicles, suprabasal cells of a variety of internal stratified epithelia, in epidermis, in both normal and hyper-proliferative situations. Epidermal injury results in activation of keratinocytes, which express CK6 and CK16. CK6 is strongly expressed in about 75% of head and neck squamous cell carcinomas. Expression of CK6 is particularly associated with differentiation. The optimal dilution of the Cytokeratin 6 antibody for each application should be determined by the researcher. 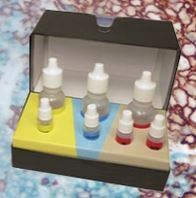 Staining of formalin-fixed tissues requires boiling tissue sections in 10mM citrate buffer, pH 6.0, for 10-20 min followed by cooling at RT for 20 minutes. Formalin-fixed, paraffin-embedded human bladder carcinoma stained with Cytokeratin 6 antibody (SPM269). This image was taken for the unmodified form of this product. Other forms have not been tested.